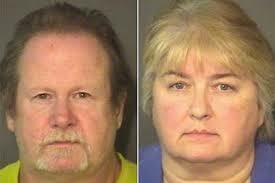 Wanda Sue Larson and Dorian Harper were arrested on child abuse charges after they handcuffed their 11-year-old foster son to the porch in November in his underwear with a dead chicken tied around his neck. The foster child and four other adopted children, aged 8, 9, 13, and 14, were removed from the home, which investigators found was littered with animal feces. It is reported that the children were often underfed and hungry and that they were chained to a piece of railroad rail found in the home when they did not finish their homeschool work quickly enough. Larson filed notice of intent to homeschool in March 2012, naming her homeschool the “Eclectic Primer School.” It is unclear when the children were placed with Larson and Harper or where they attended school before being homeschooled. Larson was a supervisor for the Union County Department of Social Services, and is being charged with failure to discharge her duty as a public official as well as intentional child abuse, inflicting serious injury, false imprisonment, and cruelty to animals. The family was reclusive and kept pigs, donkeys, llamas, chickens, turkeys, geese, and other animals.